elobeatlesforever: Turn To Stone: Solid Centre Success! 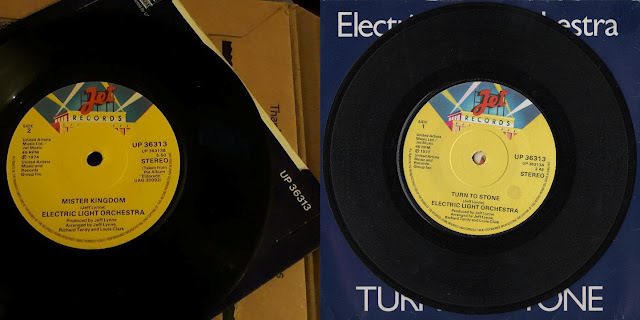 After almost eighteen months of searching and not a few false alarms, Yours Truly KJS finally got my hands on a solid centre copy of ELO's iconic 1977 single "Turn To Stone" b/w "Mister Kingdom" (Jet/UA UP36313) earlier this week. Having been alerted to its existence by ELO super collector Matt McGough of ELO UK Albums back in September 2016, I've had a frustrating "Time" trying to find a copy of the rarity for my collection and, thanx to Discogs seller Cliffs in Margate, that search is now over. One or three of my friends will doubtless be relieved that this particular vinyl quest is complete. The only downside is that I've accumulated several copies of TTS with the familiar four pronged push-out centre due to them being advertised incorrectly by various internet sellers and not being worth the hassle of sending 'em back!